I'm Just A Small Town Girl, Living In A Foodie World and since having one blog wasn't enough, I wanted a place to share different restaurants that I have gone to, mainly locally, and write about my experiences. This is mainly for my own benefit, but maybe it will inspire someone to try something new! I had been waiting to go here for years!!! 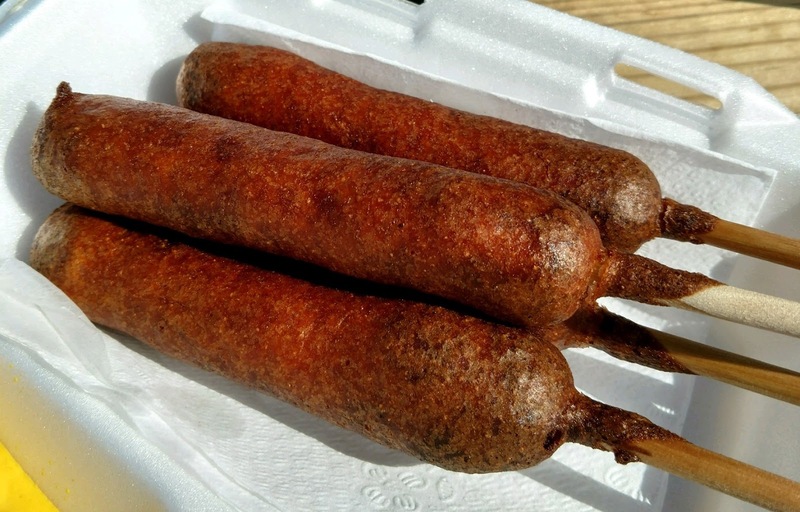 Corndogs are literally my favorite "carnival" type food and every year we visit twice, and I never stumbled upon it until this past year. I have to say I hyped myself up for it to be one of the best corndogs ever, mainly because of how long I've wanted to try them. 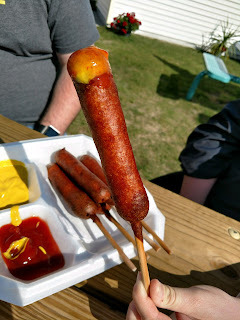 I might be able to blame this one on my husband, since he was talking to the man frying the corn dogs, but they were really, really "golden" brown. 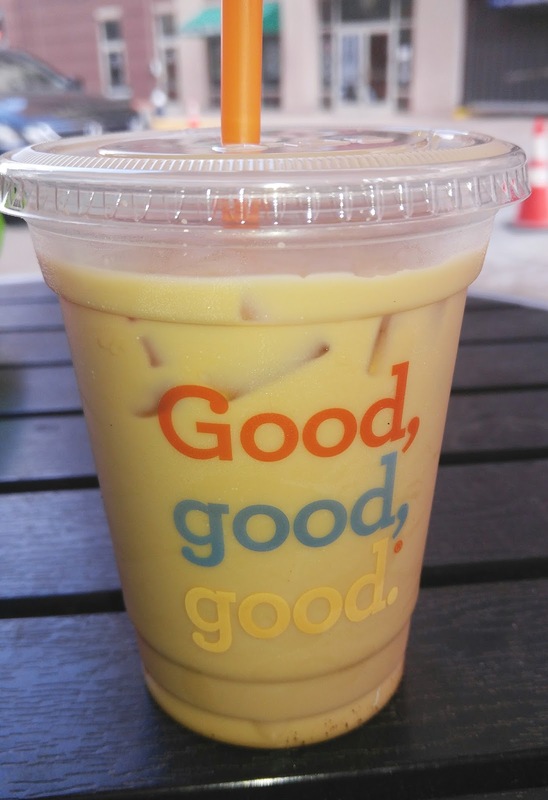 More like past golden. The batter, had it not been slightly on the burnt side, was thin and crunchy and I'm sure would normally taste amazing, but they were all overcooked and it was somewhat of a letdown. To finish up our amazing vacation in St. Louis, MO, one of my favorite restaurants of this area happened to be the one located in our hotel. The Tigin Irish Pub not only had the most aromatic mouthwatering smells coming from it, but for once I would have tried almost 80% of everything on a menu. We actually ended up eating here twice. The first time was the night we arrived, and ordered some appetizers before going up to our room to unwind. I love love love me some soft pretzels. 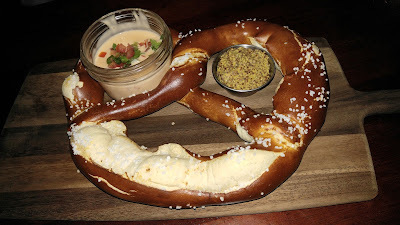 The Bavarian pretzel came with a side of course ground mustard (my favorite) and a homemade beer cheese sauce. I could have put that beer cheese sauce on my fingers and just ate it by itself it was THAT good. 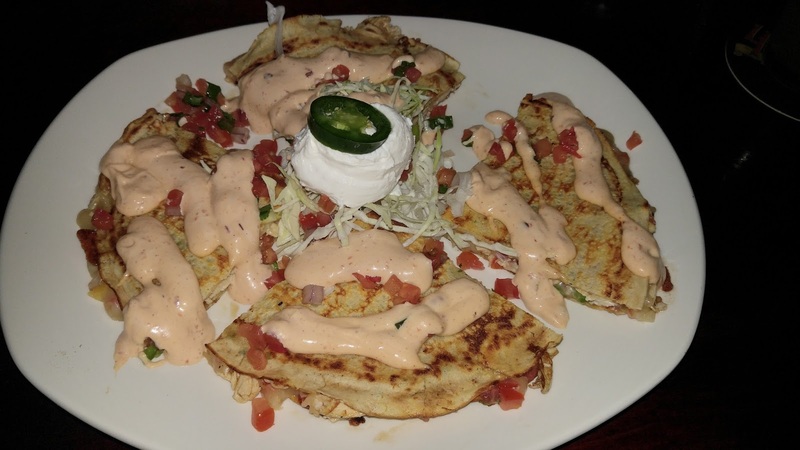 The second appetizer we ordered was the Chicken Boxty Quesadilla. The outside was two potato boxties (or thin potato pancake if you will), filled with chicken, pico, Pepper-Jack cheese, and drizzled with chipotle aioli and a side of shredded lettuce and sour cream. The unfortunate part is that I had to share this with my husband! Every part of this quesadilla tasted fresh and was packed with flavor. 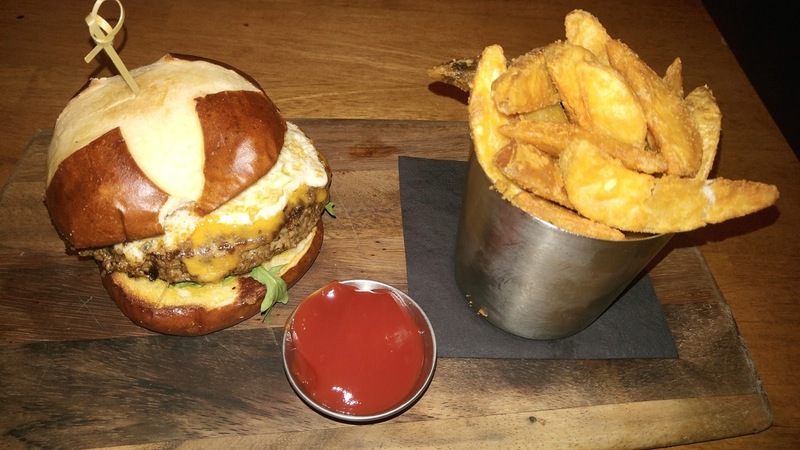 On our separate occasion of eating here for dinner, I ordered the Tigin Pub Burger, which was topped with smoked cheddar, a whiskey bacon marmalade, fried egg, arugula and tomato shoved into a pretzel roll. If the bacon marmalade was in a jar and for sale, I would have purchased a few to take home with us. It was hands down the best part of the burger. It was a little bit overcooked for me but everything worked amazing together, and was served on a wood plank! The Shepherd's Pie......the only thing bad about this dish is that I had not ordered it instead of my burger. Aside from the beef and rich vegetables that bread was to die for. 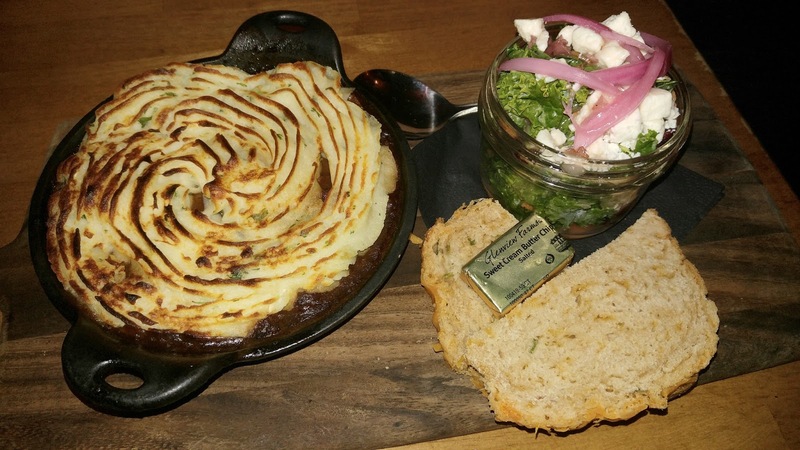 There was also a side salad that had pickled onions and feta cheese. This is the one of the best dishes that either of us ordered while on our trip. 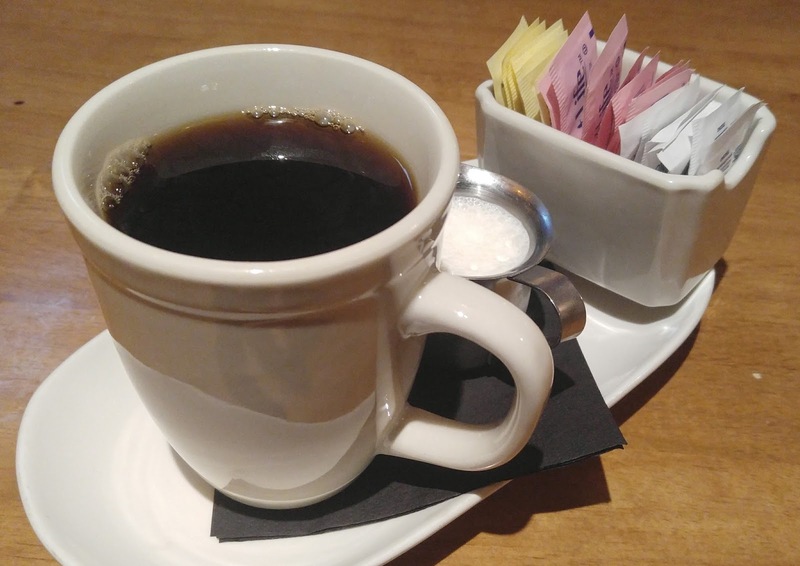 The perfect ending to any meal, other than dessert of course, is a great cup of coffee. Not only did I get my coffee but it came on a plate with all of the good stuff to stir inside! This restaurant is truly amazing and has a very homey feeling. One of the best meals we had while in St. Louis! 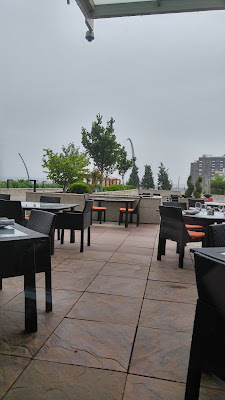 Although most hotels now-a-days come with continental breakfast, for me the whole point of food blogging and traveling is to try new places and experience new things, only time is limited. The Cafe Cornucopia was right around the corner from our hotel and had great reviews online so we stopped there for breakfast. Even for it being near a construction zone on the street at the time, there was a steady crowd of locals coming in to pick up to-go orders. I ordered the fried egg and bacon sandwich. I make these all of the time at home, not saying they are simple to do but it was mid-trip for us and I was really missing something that felt like it was home cooked. The bacon was cooked the way I love it, super crispy with the fat rendered down. The egg was good for the yolks being broken, maybe a little overcooked, but still tasted great with the crispy edges. My own pet peeve is again (and if you follow my blog I am like a broken record on this one), the greasy over crunchy bread. 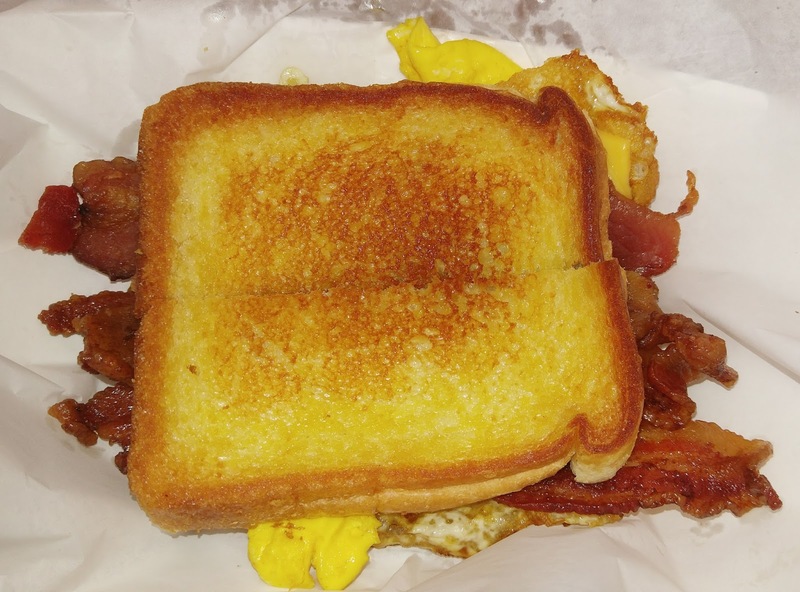 I wish I would have just asked for the insides put in between two lightly toasted pieces of bread, with no butter on the bread but it was still a great breakfast sandwich. After looking at the pastry selection, we also decided to split a turnover. It was delicious. There wasn't a ton of filling which was a bummer, but since we had to rip it in half to split, I guess it was more of a godsend so that we didn't make a huge mess! 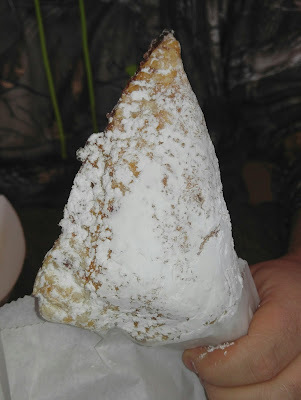 And mmm the powdered sugar on this thing! This was a great decision to stop here. All of the food was something I cook from the comfort of my own kitchen, including the pastries, so it was a little slice of Michigan in the middle of Missouri. While walking around in downtown Saint Louis, I wanted to find somewhere that I could try gooey butter cake from, and well, I am also a huge coffee addict. 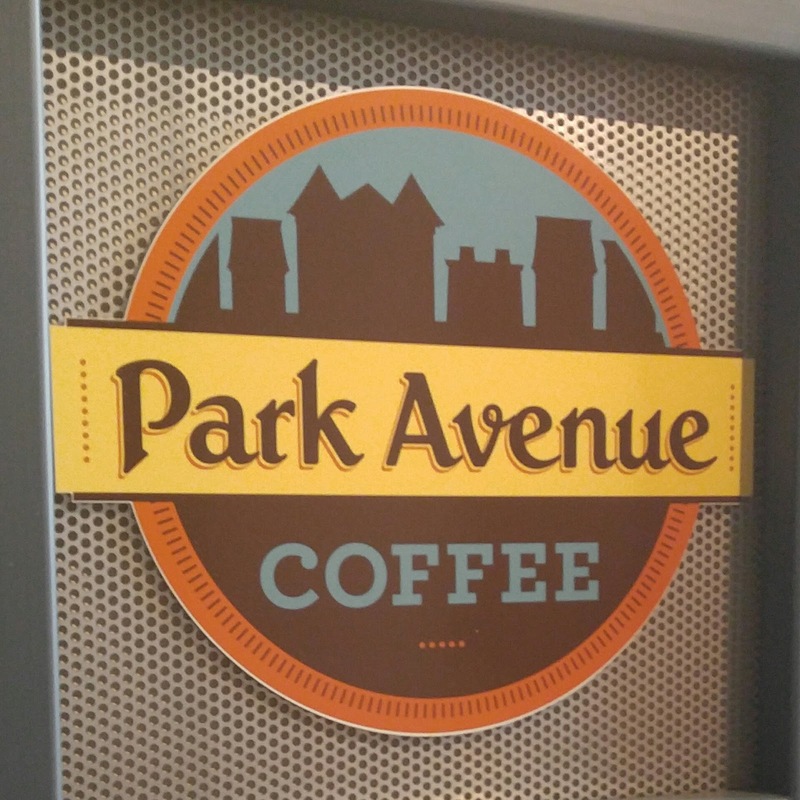 Park Avenue was pretty close to our hotel so we stopped in to check it out. 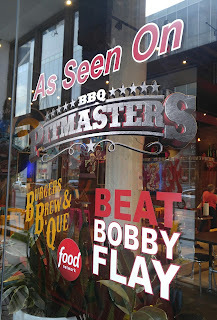 And I of course love visiting restaurants and places that have been featured on Food Network. The inside of the coffee shop was very business oriented. They had a room of seating that was pretty filled, and most people had a laptop open and a cell phone to the ear. Aside from the noise, everything in the bakery counter looked divine. 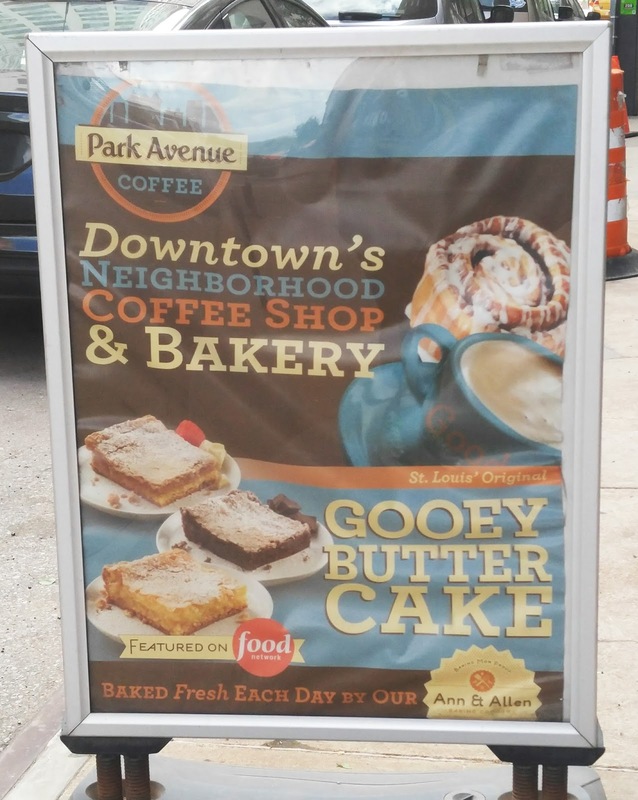 I ordered the Park Avenue iced coffee and we got a gooey butter cake square to share. There was one more table left outside so grabbed it, along with our plastic forks, and dug in. 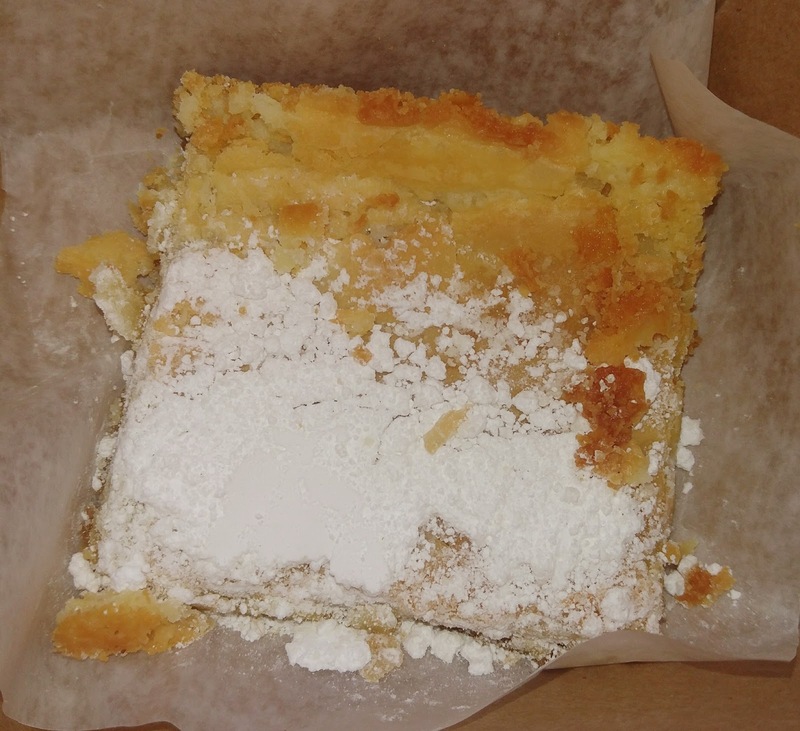 This was my first time ever having butter cake, and aside from it probably being absolutely terrible for you, it was exactly that, a "gooey, buttery, cake". Although my husband didn't think it was anything to write home about, I thought it was amazing. 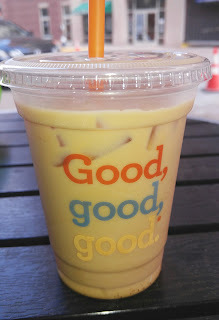 And the coffee I washed it down with was pretty darn tasty too! 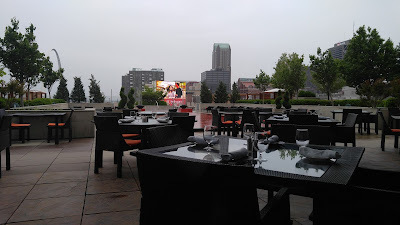 My husband and I had a great opportunity while in Saint Louis to get dressed up in fancy clothes and go out somewhere more upscale for dinner. 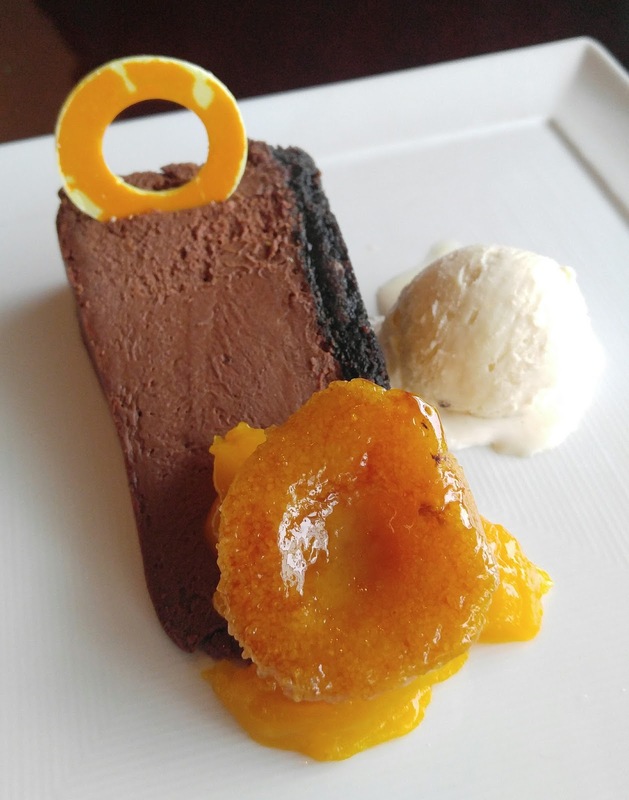 After finally finding the Cielo restaurant (our map sent us through the casino and a few other places first) within the Four Seasons Hotel, we had worked up quite an appetite. Looking around the restaurant, I was surprised to find that many people were wearing casual dress and other than one large table of people that looked straight out of the show "Real Housewives", we were quite overdressed. 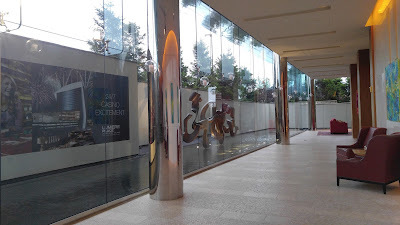 The decor was absolutely beautiful and we decided instead of picking two items off of the menu, that we would do the four course "Tour of Italy". And since we wanted to try multiple dishes, we both ordered opposites for appetizers, main course, and dessert. One of the appetizers was a bruschetta style crostini, topped with goat cheese and roasted cherry tomatoes. You can't usually go wrong with the tomato, cheese and bread combination. The only problem I had was that it was lacking more acid and flavor, like a balsamic reduction or fresh basil. The menu stated that there was mint and basil added somewhere but those flavors did not at all come through. For his appetizer, it was quite underwhelming as a start. My appetizer on the other hand was also very simple, but done to perfection. The chicken consomme was almost a play on if chicken soup and Italian wedding meatball soup had a child. The meatball was cooked to perfection, along with the vegetables. 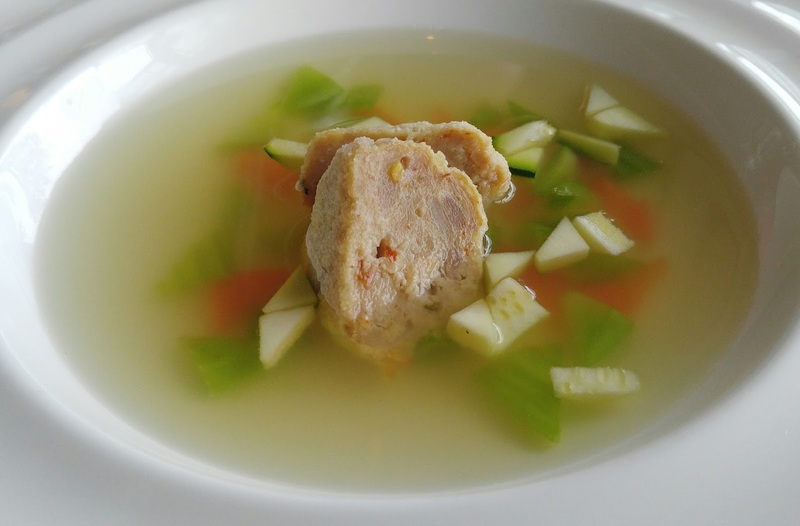 That broth was packed with flavor and the only thing I would complain about is that there was only one meatball and I wanted more! The next course topped another level for me. The lemon and saffron gnocci was so light in flavor. 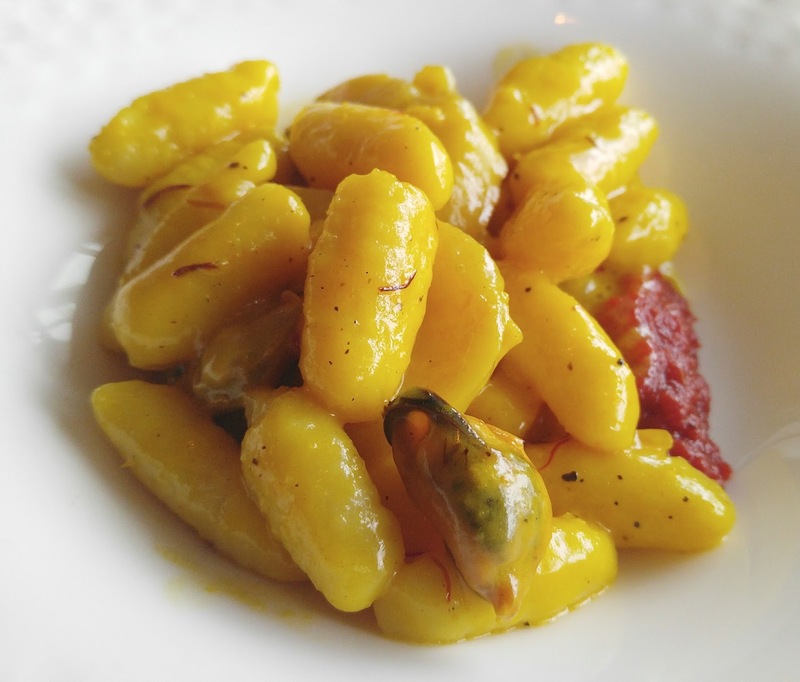 The biggest worry with gnocci is that it will be dense and doughy but this dish didn't disappoint. I am not even a fan of seafood, but tried a mussel 'by accident' and it was very good. I ordered the Arugula Pappardelle, which was topped with a pork cheek ragout and pistachios. The pork was sweet and pulled apart with a fork like butter, and the arugula pasta was nice and peppery. Everything paired very well together. Our main course, which sounded so good that we both ordered the same thing, was the short ribs. They were sous vide for 72 hours making them unbelievably tender. 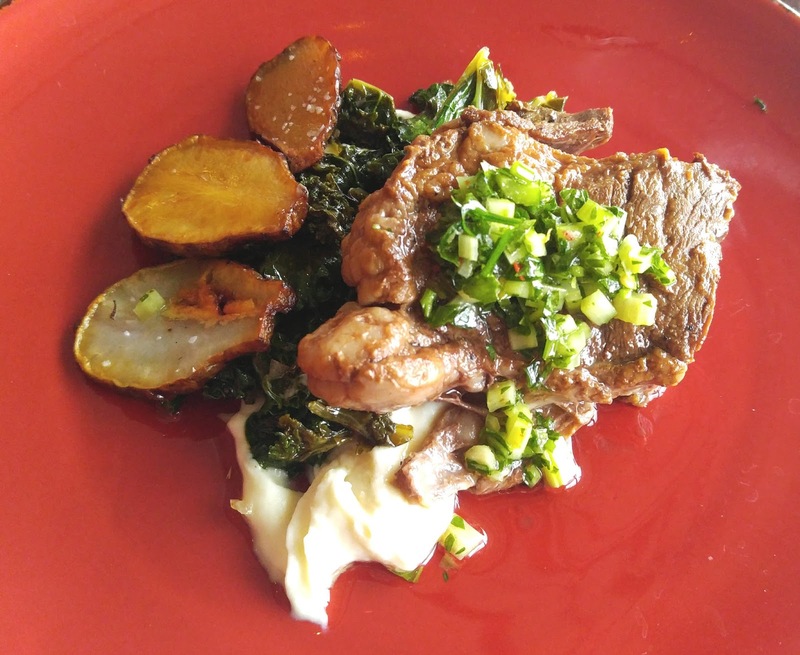 The parsley root puree was light and creamy and I couldn't even tell that it wasn't a potato puree. I have never had sunchokes before but they were tender and very earthy. My only hesitation with short ribs is that unlike most people, I can't stand the tiniest bit of gristle and end up cutting it off. I had quite a big piece on mine that my husband ate for me, because to most men "that's the best part". This was hands down my favorite part of our meal. The chocolate cheesecake was pretty underwhelming. The chocolate used was very bitter. 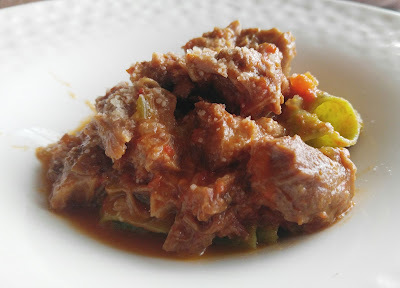 The only aspect of that dish that helped save the flavor was the cooked apricot half. I would have rather eaten a bowl of the apricots by themselves. 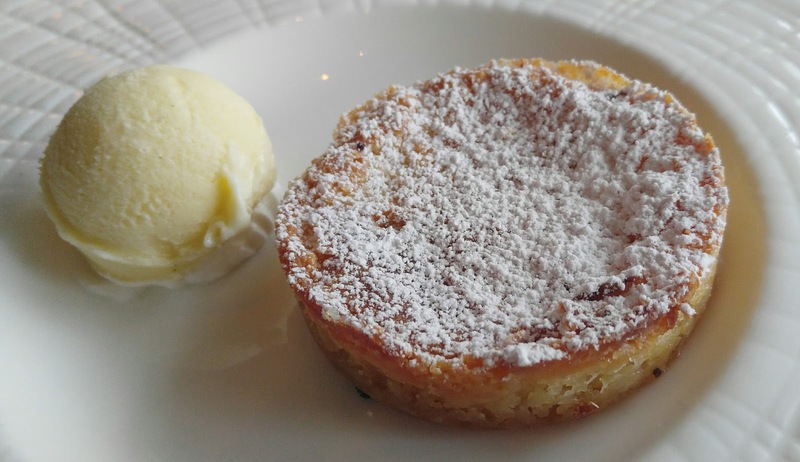 The gooey butter cake and side of ice cream that I ordered was heaven. 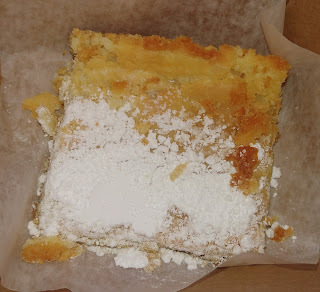 It tasted like if you crushed a bunch of shortbread cookies together and then added melted butter and topped it all with powdered sugar. Amazing. The four courses overall were definitely worth the money. 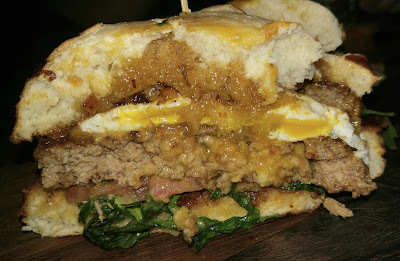 Many of the dishes had well thought-out flavors and made up for the underwhelming lack of depth in others. Would we return again while visiting? Absolutely. I think more restaurants should have the 'tasting menu' approach. It is a great way to try multiple dishes in small portions. The short rib dish alone, would bring me back. 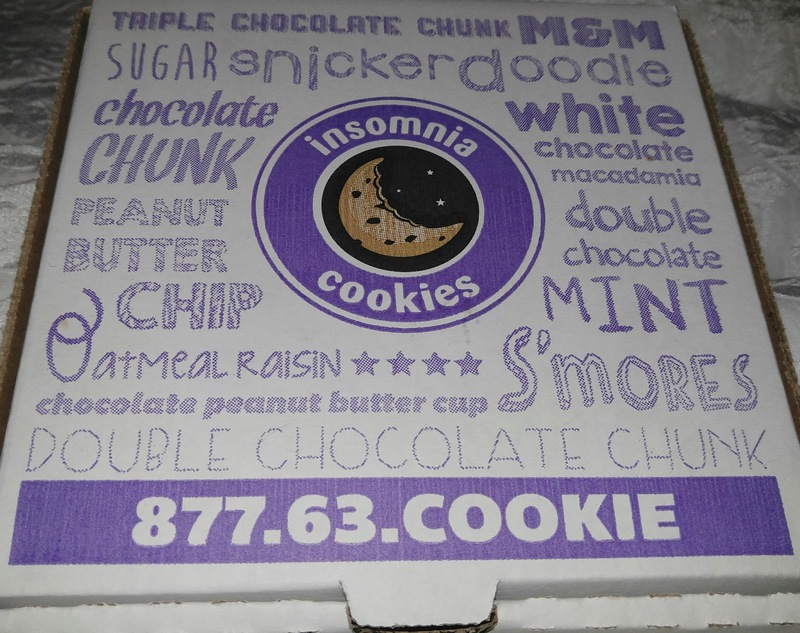 This has to be the best idea for a cookie place that I have ever heard of. My husband and I were walking back to our hotel in St. Louis, Missouri after having fun at the City Museum and came across this tiny (and I mean tiny) little cookie place. 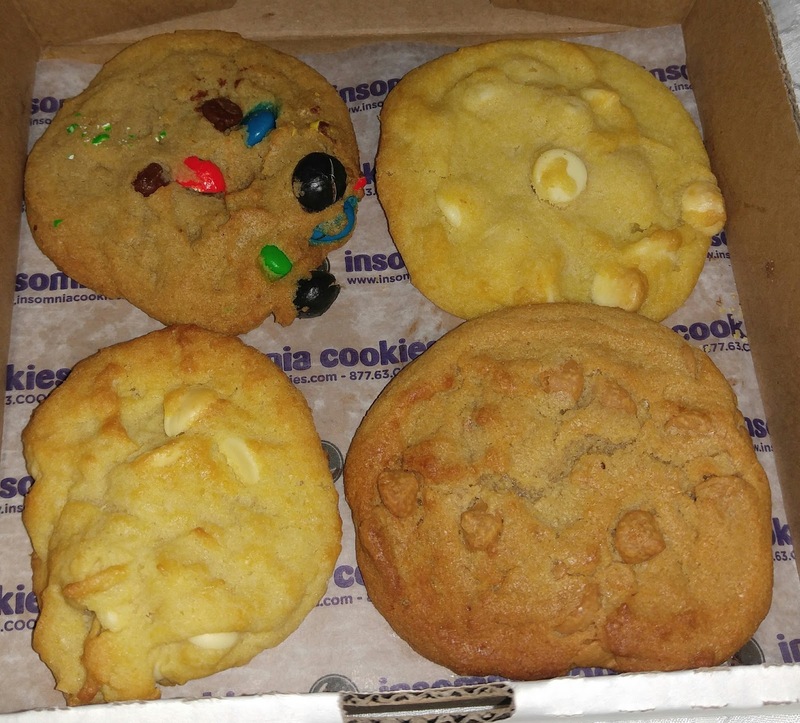 Got a hankering for a cookie after bar time? No problem! They deliver from noon to 3AM every day! Best part of all is whether you stop in to get some cookies on the go, or get them delivered, they are served to you warm! The owner of this franchise really had a great idea with this one. Maybe it has to do with the fact that it all started in a dorm room in Pennsylvania. Being from the Upper Peninsula of Michigan, I had never heard of this franchise but there are 90 locations in the U.S. If you happen to be vacationing, or live by one, you should definitely order some of these warm, tasty cookies! On our first day of vacation in Saint Louis, we had to get some authentic BBQ from somewhere. 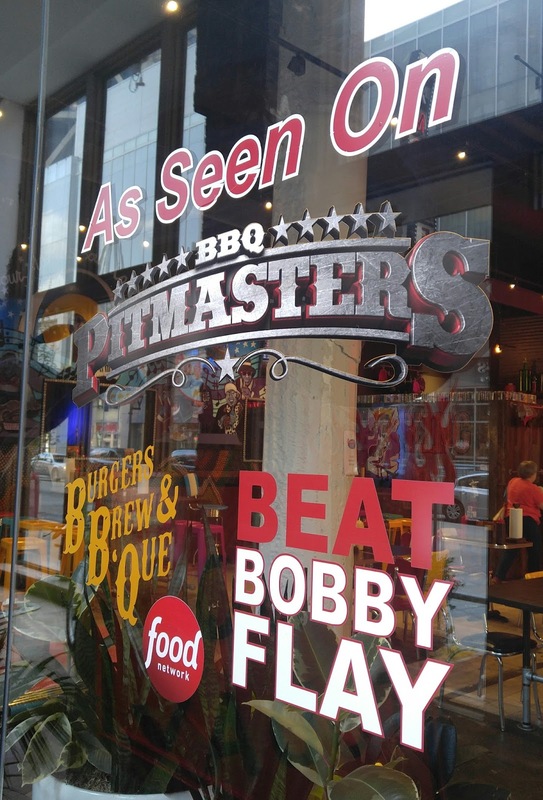 I am a huge Food Network fan and Sugarfire has been featured on multiple shows, and what BBQ contests HASN'T it won? 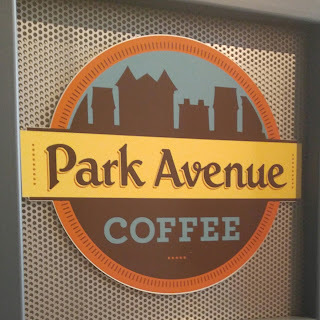 The best part, is that since we picked one of the busiest times to visit Saint Louis and kept our car parked at our hotel, this was in easy walking distance from us. The bad part of our experience at Sugarfire had absolutely nothing to do with the food. The food was fantastic, as we will get into here shortly. I am the type of person who gets semi flustered in large crowds of people who are all waiting in line so I was pleased when we went at an "off" time after lunch and were the only ones in line. I'm sure to wait on people here and be in the buffet line you have to be a rockstar and are used to dealing with large quantities of people. 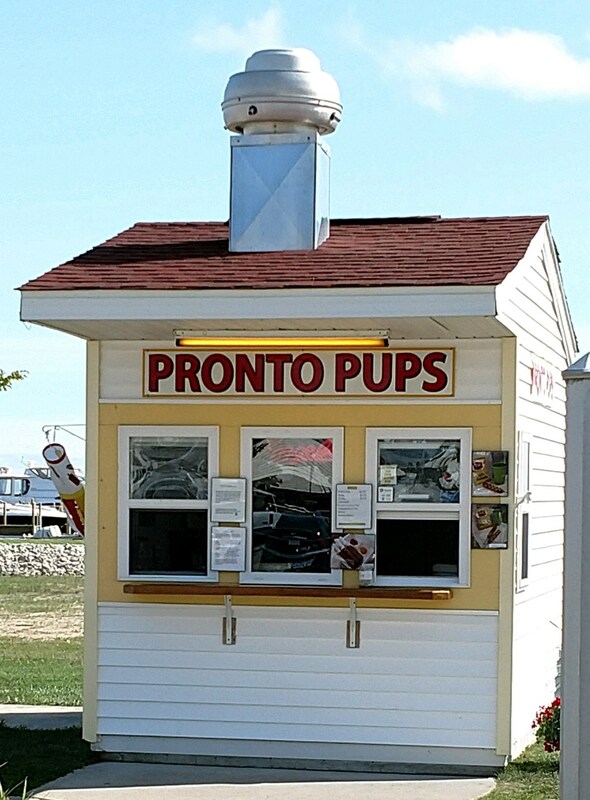 It doesn't mean, however, that when someone tells you they have never eaten here before, that you roll your eyes and start acting impatient. There was no one else in line! 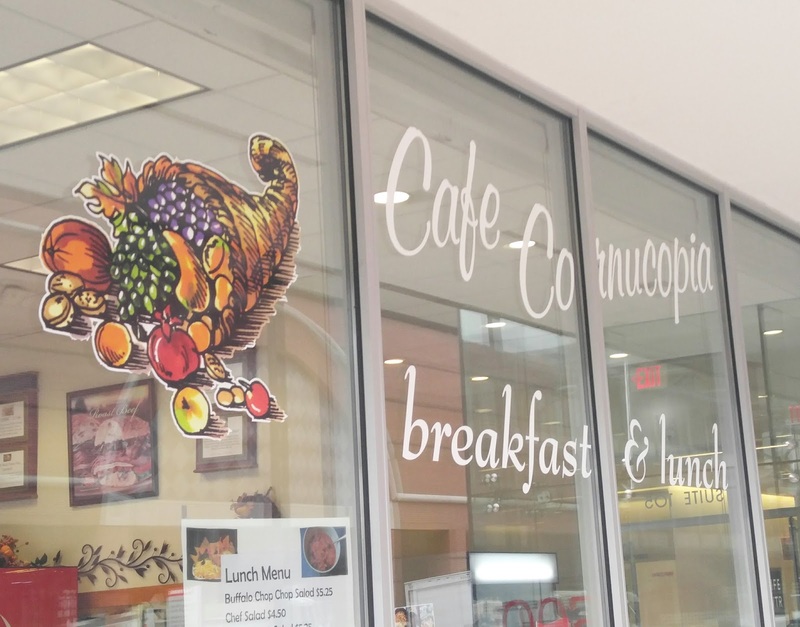 We had ordered the food already which was being made, but the person at the cash register was absolutely rude like we were holding up a line of 100 people. This is why I usually choose a sit down restaurant because I hate the feeling of someone rushing you and belittling you when it is your first time and experience in a new place. No matter how great the food is after that, you have already given me a negative reaction to wanting to eat at that restaurant again because if I end up feeling uncomfortable for no reason other than someone's impatience, why would you go back again? Thank goodness for the waitress who runs food to the table, and how nice they were and made a quick joke about his attitude, because I probably would have thrown my shake at the cashier and just walked out at that point. 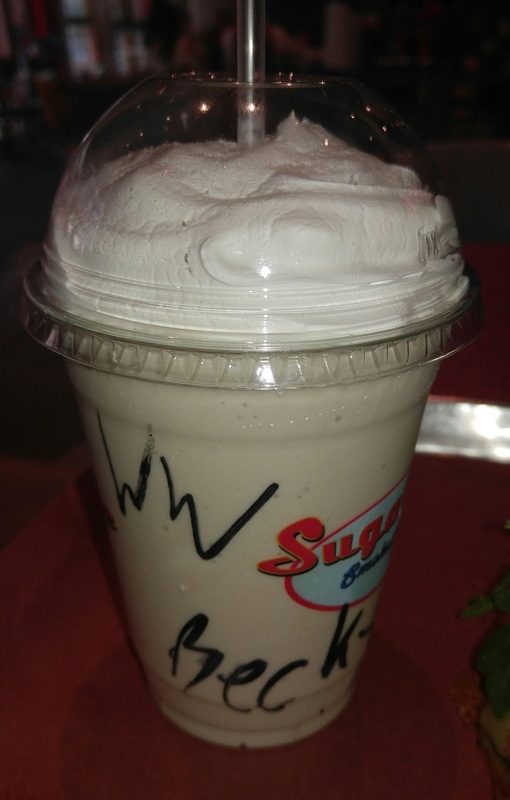 Speaking of shakes, I ordered the White Russian shake for a drink. Thank goodness they had alcohol! I not only needed it at this point, but it was the hottest day that we were there and it was very refreshing to have a nice cold drink while waiting for food. It was on the stronger side, but once I mixed in the whipped topping with my straw it was perfect. 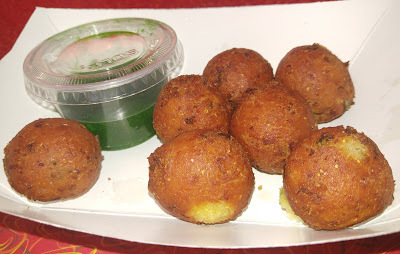 The appetizer we ordered were the pork belly hush puppies with jalapeno jelly. I couldn't really taste the pork belly part of the description, but the hush puppy dipped in the jelly was really good. My husband ended up stealing most of them because they were his perfect consistency. He liked them still a little bit gooey (or raw technically) in the middle, and I like it cooked all of the way through so it's more like cornbread. 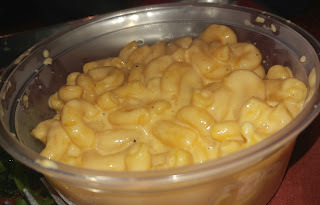 The mac and cheese for my side dish was a melted gooey container of liquid gold heaven. 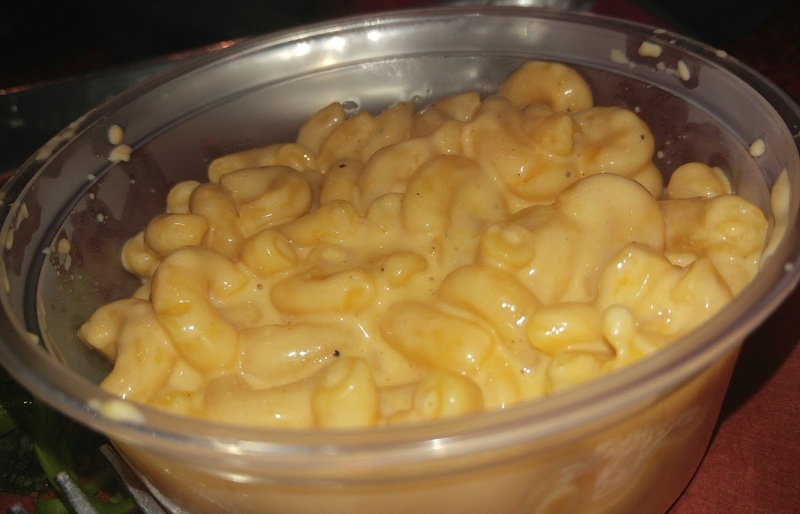 I don't know how much more positive I could get describing a mac and cheese dish. It was creamy, cheesy, not too liquid where you feel like your noodles are swimming, but not dry that it sticks together like paste. It was just great mac and cheese. We both ordered the special, which was the Ultimate Ham and Cheese sandwich. 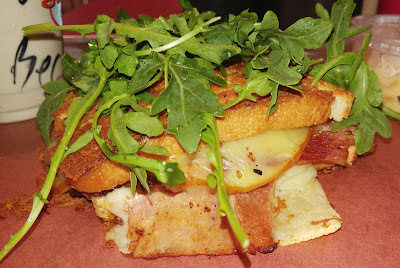 It was layered with smoked country ham, Swiss and smoked Gouda cheese, Parmesan, Truffle and Arugula. That is a mighty fancy grilled cheese if you ask me, and it was all amazing. The salty ham and the melted cheese with the sharp arugula on top was delicious. It was the perfect combination of flavors and nothing overpowered anything else and every bite was filled with gooey melted cheese and ham. If someone else picked this restaurant to eat at again, I would totally do it, but I would order it online on the website so that I wasn't rushed and meant to feel like an idiot. All of the food looks amazing, and everything we tasted was delicious, but I can't deal with rude people like that. 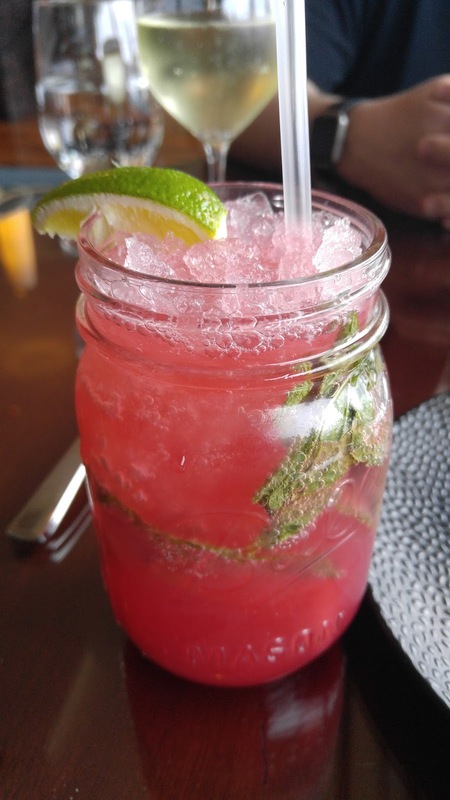 Going to new restaurants and traveling should be a fun experience and if your restaurant is that well known and famous, they are obviously doing everything right as far as food goes. Was it just an off day for the cashier? Maybe, which is why I didn't say anything back to be polite. However, that experience could have been so much better with a fake smile and polite attitude, even if you didn't want to be at work that day. Lagniappe, a taste of New Orleans in the U.P. All Content Copyright Rebecca Bond 2014. Simple theme. Powered by Blogger.